Dr. David Ben-Shlomo is Co-Director of the Khirbet el-Mastarah excavation project. He serves as an associate professor of archaeology at Ariel University. He is co-editor of Judea and Samaria Research Studies. He completed a Ph.D. degree in Biblical Archaeology and Archaeometry in 2005 at the Hebrew University, Jerusalem. His main research interests are Bronze and Iron Age archaeology of Israel, proto-historic architecture, the Philistine material culture, archaeometry and petrography of pottery, and ancient art and iconography. He has been involved in archaeological fieldwork since 1996, and has been on staff at the excavation projects at Sha’ar Hagolan, Tel Tsaf and Tell es-Safi/Gath in Israel. He co-directed the excavations at Tel Hebron in 2014. In addition to many articles in Near Eastern and Biblical archaeology, ancient art and archaeometry, he has published seven books, including the final excavation reports at Ashdod, Azor, Sha’ar Hagolan and Tell Jemmeh (with G. Van Beek, The Smithsonian Institution Excavation at Tell Jemmeh, Israel 1970-1990, Washington DC, SISP, 2014), and Philistine Iconography: A Wealth of Style and Symbolism (OBO 241, Göttingen: Vandenhoeck & Ruprecht, 2010). He and his wife, Anna, have one daughter, Tamar (20), and two sons, Nadav (18) and Dan (10). 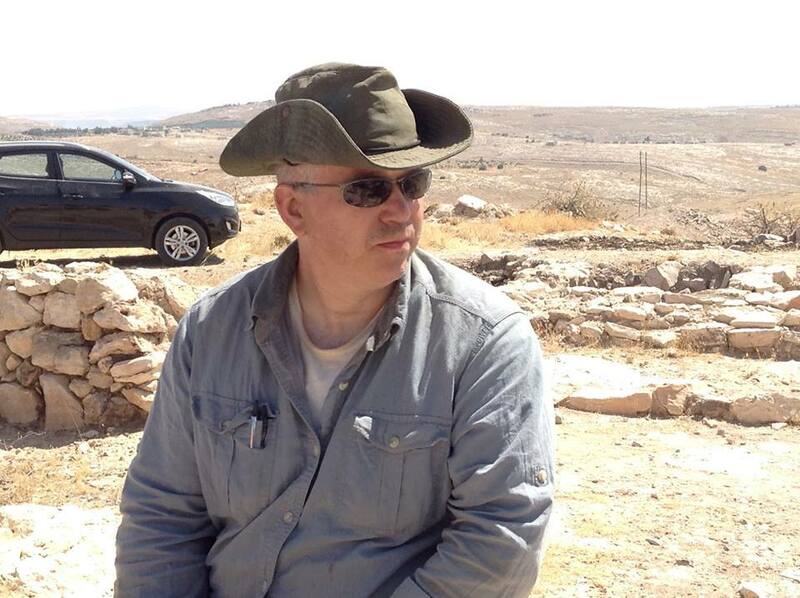 Dr. Ralph K. Hawkins is Co-Director of the Khirbet el-Mastarah excavation project. He serves as Chair of the Department of Religious Studies at Averett University, in Danville, Virginia, where he is also an associate professor of Hebrew Bible and archaeology. He completed a Doctor of Ministry degree in 1999 at the School of Theology at the University of the South, in Sewanee, TN, and a Ph.D. in Near Eastern Archaeology in 2007. He has been involved in archaeological fieldwork since 1995, and has been on staff at Tall Jalul and Khirbet ‘Ataruz, both in Jordan. In addition to numerous articles and reviews in Hebrew Bible and Near Eastern archaeology, he has published The Iron Age I Structure on Mt. Ebal: Excavation and Interpretation (Winona Lake, IN: Eisenbrauns, 2012) and How Israel became a People (Nashville, TN: Abingdon Press, 2013). An ordained minister, Hawkins has also written pastoral books, including While I Was Praying: Finding Insights about God in Old Testament Prayers (Smyth & Helwys, 2006), and Leadership Lessons: Avoiding the Pitfalls of King Saul (Nashville, TN: Thomas Nelson, 2013). He and his wife, Cathy, have three daughters, Hannah (19), Sarah (18) and Mary (14), and a son, Adam (11). Dr. Edward F. Maher is the zooarchaeologist of the Khirbet el-Mastarah excavation project. He serves as Lecturer of Anthropology at North Central College, in Naperville, Illinois. He completed his M.A. at the Katholieke Universiteit Leuven in Belgium in 1997 and his Ph.D. in 2003 at the University of Illinois at Chicago, Illinois. His main research interests include Bronze and Iron Age Levantine archaeology, empire, economies, ritual, animal sacrifice, trade, and site abandonment. He has been involved with archaeological field excavations since 1993. He has studied the faunal remains from many sites in Israel, including Ashdod, Akko, Azor, Tel el-Farah (south), Tel Harasim, Jaffa, Tell Jemmeh, Lachish, Tel Miqne-Ekron, Tel Mor, Tel Shadud, Khirbet Summeily, Qubur al-Walaydah, and Tel Zayit. He has also conducted zooarchaeological analysis from Mudaybi in Jordan, Zincirli in Turkey, and the Classic Period Zapotec site of El Palmillo in Mexico. He has authored numerous faunal articles, some of which have appeared as volume chapters, including: “Flair of the Dog: The Philistine Consumption of Canids,” in The Wide Lens in Archaeology: Honoring Brian Hesse’s Contributions to Anthropological Archaeology (Atlanta, GA: Lockwood Press, 2016) and “Lambs to the Slaughter: Cultic Orientations at Philistine Ekron in the 7th century BCE,” in Material Culture Matters: Essays on the Archaeology of the Southern Levant in Honor of Seymour Gitin (Winona Lake, IN: Eisenbrauns, 2014). An avid collector of comic books and a lifelong fan of hockey and heavy metal, he and his wife have no children but are kept busy tending to their three cats.